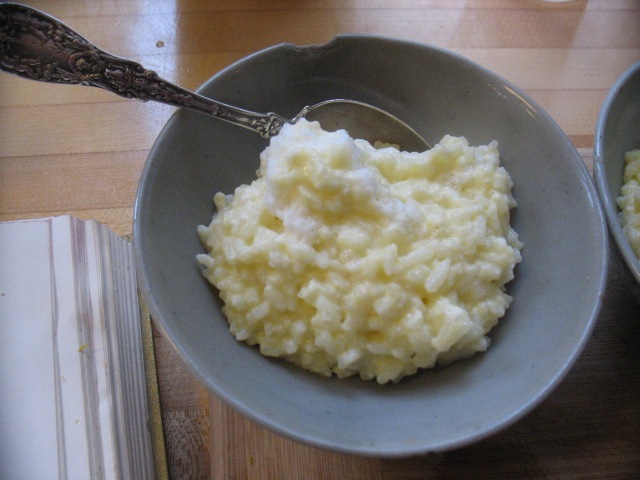 One of the first things I remember my husband cooking was this rice custard. We have been together 19 years today and I remember him talking to his mom over the phone asking her to track down this recipe that he had made as a kid. The phone conversation resulted in a somewhat terse handwritten version on a scrap of paper that he occasionally unearthed from my overflowing recipe binder over the years. 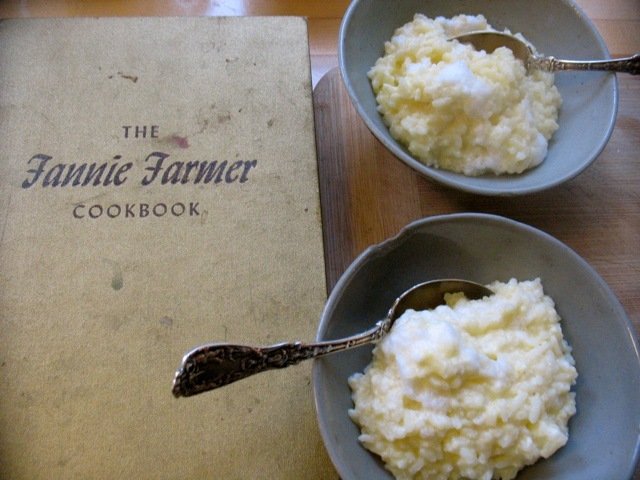 Many years later his mother gave him the old Fannie Farmer Cookbook (1959) where this recipe originated. This last weekend Brian made the rice custard again, on a lovely lazy Saturday (the first Saturday in a month that I hadn’t taught a class) and we ate rice custard at 4:30pm with the sun shining in the window. Ellis exclaimed gleefully mid-way through his bowl, “we’re having dessert right before dinner!” I spooned the very last of my boozy fruit (mostly cherries preserved in rum that had been “marinating” for 7 months now) over the custard and found the custard to be the perfect foil for it. So there we were the three of us, eating warm, luscious rice custard on a late afternoon in February almost 20 years since Brian and I first met. As old as I sometimes feel these days, life also just seems to be getting better and better. And food made with love . . . don’t need much more than that. 2 generous cups cooked rice (we use white Jasmine but short grain brown or white could work too) from one cup uncooked rice. 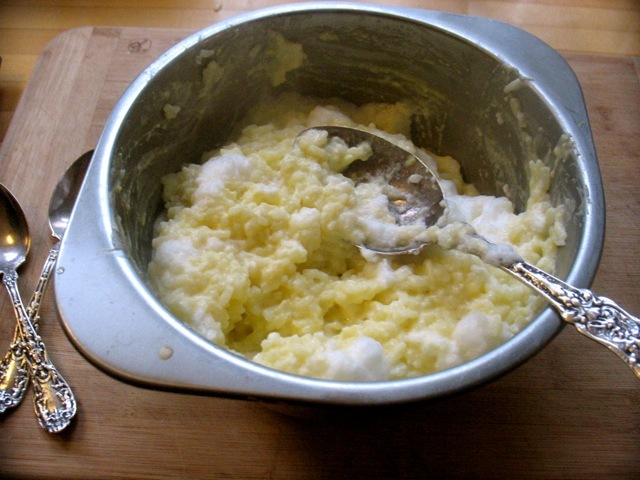 Add the hot milk and rice slowly, whisking constantly, to the egg yolk and sugar mixture. Pour back into the double boiler and cook until thickened (about 10 minutes would be my guess). Remove the bowl from the heat. Gently fold in the two stiffly beaten egg whites. It’s best warm, right after it’s made.